Top performing Canberra Institute of Technology (CIT) electrical apprentices have progressed to the regional finals of the Middy's Legrand Fit-Off Challenge, competing to take out the top spot this week. 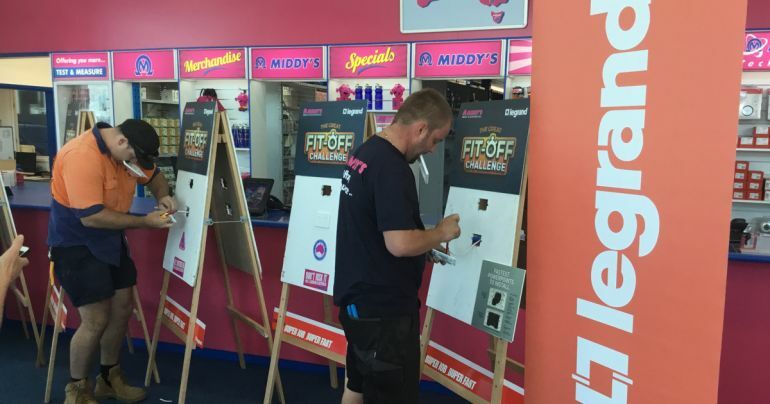 The Fit-Off Challenge provides apprentices with the opportunity to put their hand skills and speed against each other with a challenge sponsored by industry partners Legrand and Middy's providing invaluable networking opportunities. Legrand ACT & Riverina Area Manager Bruce Galloway said the first challenge kicked off at CIT and even a few staff jumped in to have a go at the challenge themselves, producing some excellent times. "CIT has a proven track record in providing excellent technical training and further education for students. We are very proud to work with such a reputable institution that takes a holistic approach in providing students with a completely personalised and hands-on learning experience," Mr Galloway said. Some impressively fast times have seen finalists from CIT and two TAFEs be selected to travel to the Legrand Manufacturing Factory in Prestons to battle it out in the Grand Final. The challenge tests students' ability to fit-off an Excel Life ED777WE powerpoint in the fastest time. In order to be eligible to participate in the competition, students are required to follow the correct installation guidelines. CIT's Executive Director Industry Engagement & Strategic Relations Paul Ryan said CIT shares Legrand's vision for providing students with pathways to build their professional skills through industry collaboration. "Strong industry connections are critical for a well-rounded learning experience. It not only gives students real, practical experience but also provides unique opportunities for them to engage with industry and have the best access to their future employers," Mr Ryan said. Find out more information about CIT's Electrical Trades here.